A quick cheesy Mexican tortilla which can be enjoyed with a variety of sauces and salads. Chop the peppers, red onions, and tomatoes into small cubes. Grate the cheddar cheese and mozzarella. Place all the ingredients in a bowl and add a little salt and pepper according to taste to make the quesadilla filling. Place the tortilla wraps flat in a frying pan and add the filling accordingly on one side and fold the wrap in half. Cook the tortilla wrap for about 5 mins, once golden brown turn over and cook for another 5 mins and check if cheese is melted, then take it out of the pan. 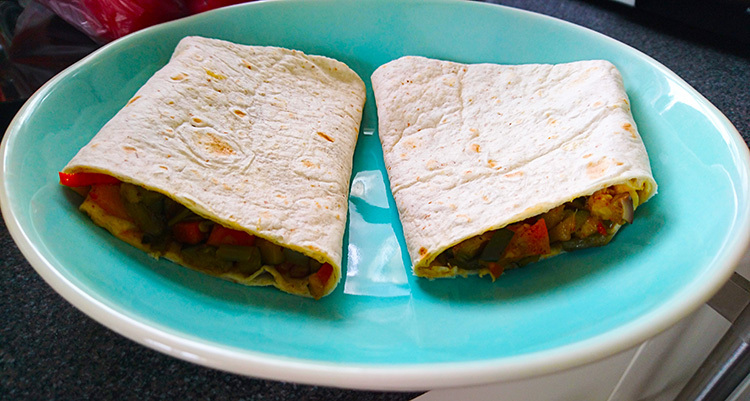 Cut the Quesadillas in half or quarters and serve hot. Optional accompaniments of your choice can be used to add more flavours.